Online product recommendations (OPRs), which include provider recommendations (PRs) and consumer reviews (CRs), are widely used in e-business to improve consumers' shopping efficiency, which consists of product screening efficiency and product evaluation efficiency. We construct a research model to explore the effect of perceived quality of OPRs on consumers' shopping efficiency and the moderating role of product type, which usually includes search and experience product. Using an online questionnaire survey with 174 valid participants, our findings provide strong support for the proposed model. The empirical results reveal that higher perceived quality of OPRs is associated with higher consumer shopping efficiency. What's more, the impact of perceived quality of PRs on screening efficiency is stronger for experience products than for search products, but the effect of perceived quality of CRs on screening efficiency is stronger for search products than for experience products. However, the moderating effect of product type on the relationship between perceived quality of OPRs and evaluation efficiency is not significant. Hanyang Luo, Fangfang Zhang, Jing Liu, Xin Li. "Empirical Research on the Effect of Online Product Recommendations on Consumers' Shopping Efficiency. 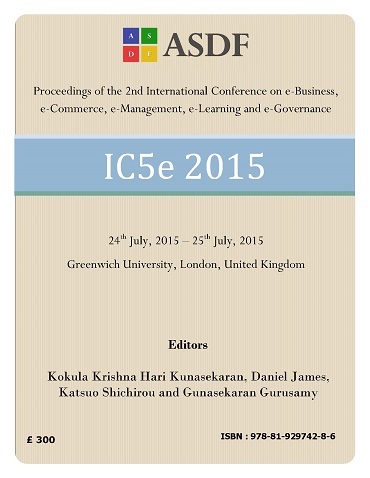 "International Conference on eBusiness, eCommerce, eManagement, eLearning and eGovernance (2015): 88-92. Print.